If one pronounces 맛있다 as masida, shouldn't it also be maseopda for 맛없다, to keep it consistent? Here on duolingo they pronounce 맛 as mat when it comes with 없다 and mas when it comes with 있다. I notice the same going on with 멋, which alternates between meot an meos, shouldn't it be the same pronunciation in both? thanks for showing me Koreanfromzero. I've been looking for online learning materials for quite some time and this one really strikes me as very very very good. I'm thinking it has something to do with the character ㅅ is 'named' sheut so if it's use can be a she or a ut sound. Though, I haven't figured out exactly when and where... I know not really helpful but maybe a clue? 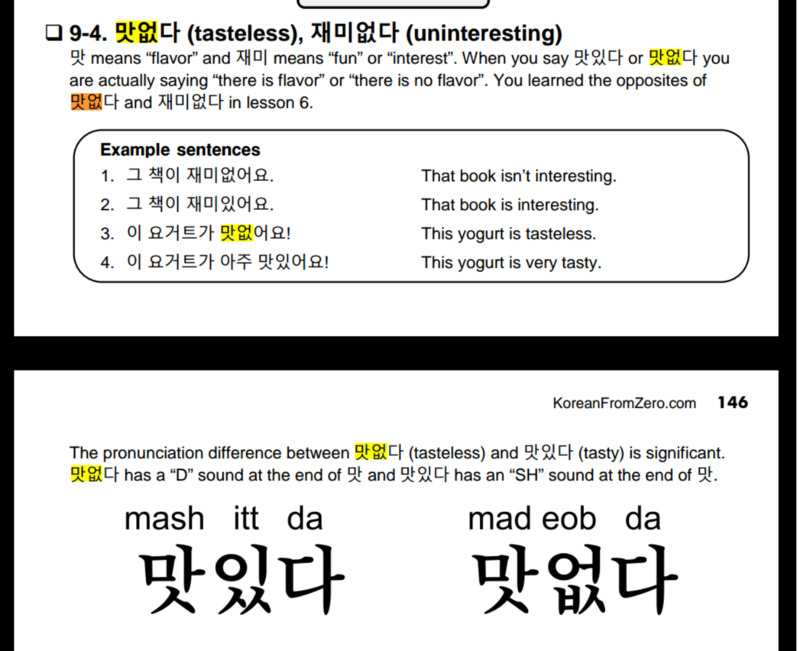 I've read somewhere that if a final ㅅ is followed by an initial ㅇ placeholder, it gets its /s/ pronunciation back. So here the audio is indeed wrong. It sould be saying "maseopseumnida". So here are all of the pronunciation rules I'm aware of for final ㅅ: -It's pronounced /n/ when followed by an initial nasal consonant (ㄴ or ㅁ) -It's pronounced /s/ when followed by the silent placeholder consonant (ㅇ) -It's pronounced /t/ in other cases. I've heard that for 맛없습니다, pronouncing it as "mat-obs-seub-ni-da" is actually correct even though usually the ㅅ sound would "move" to the next syllable if it isn't followed by a consonant sound. This is just because it sounds/flows better and it's just how everyone says it. Similar I guess to how 습니다 is spelt "seub-ni-da", but is actually pronounced "seum-ni-da" in conversation; rules of pronunciation don't seem to always apply! This word is an exception to the pronunciation rule. The audio is not wrong. Isn't it interesting how in a lot of languages, including Latinate languages, the word "bread" starts with a "p/b" sound? I wonder if it's like "mom," which the reason why it almost always has "m" in it, is because it's one of the babies first sounds it can say. Hmm. Is anyone else having hearing problems with this one? So is 있 "good" and 없 "bad"? I think its more like "is" and "is not", or "have" and "do not have". Like 남자가 멋있습니다 would translate more into "the man HAS coolness"
Does anyone know when you're supposed to use 빵이 or 빵은?? Urgh this is my problem as well. I'm just gonna assume that 가 and 이 are for more specific subjects (like the bread in the sentence) and 는/은 are for general statements. Maybe "Bread tastes bad." translates to "빵은 맛없습니다"
Yes literally it means no flavor or not delicious. But generally it means bad. There's a seperate word for bland. It really means it has the quality of having no taste, but for this lesson they are calling it bad. Could "The bread has no flavour" be accepted? Shouldn't "The bread is nasty" also be accepted? I put 'the bread tastes bad' and it said it was wrong . I translate it "the bread has not a good taste"
So 맛있습니다 is "tasty", while 멋있습니다 is "cool"? Only one letter difference? Why is there a 이 on the end of bread?